Designation: Research Scholar, University of Management and Technology- Lahore. List of Author(s): Ullah N, Ali W, Ali M.
Copyright: © 2018 Ullah N. This is an open-access article distributed under the terms of the Creative Commons Attribution License, which permits unrestricted use, distribution, and reproduction in any medium, provided the original author and source are credited. This study investigated bullying behavior, understanding among students and its associations with the confidence of bullying victims. Academic life becomes disturbed due to lack of confidence, low grades and drop out from education institutions, ultimately victims become unproductive property of society. The associations found between variable “knowledge of bullying” and “lack of confidence” was positive and significant. The whole population, area of the study was 3004 and the sample was 151. This was passed through stratified random sampling as well as from every stratum of the total population 5% sample was selected. Chi square and Gamma tests were applied to measure association and direction of the relationship between dependent and independent variables. These findings showed bullying as a chronic social illness, for which proper strategies and programs are required to cure it which include sensitization of all stakeholders. The suggestion was preceded that bullying prevention remedial strategies, discussions, conferences regarding bullies should be arranged in the University level. Bullying has been constituted to be related to a reply of denial psychosocial operation among children who are make a victim of, including quieter self-esteem ; increased rates of pessimistic sense ; the state of persistently worry has been saved and different type of mantel disquiet had been spawn in the individual, certainly, having companioned by strongly motivated to succeed behavior or assault of panic ; feelings of isolation [4,5]; suicidal process of forming and relating ideas ; and higher rates of school habitual students are become start absence from school [6,7]. For general explanation there are some perspectives about bullying: these perspectives define some divergence in bullies’ paradigm among the researchers. Bystanders’ view of paradigm: most of the bystanders (83.4%) thought victim’s tough behavior or attributes stimulate them to become a patient of bullying. Then, (40.7%) of the bystanders replied bullies behave such as others. The others behavior became a role model and also a kind of pressure. When this type of condition occurs, then it is the primary duty of the victim that he should decrease the incident of bullying. There were some other causes of bullying: bullies struggle to show their power. So, it has been proven that behaviors used to asseverate like prevail could include speaking torment or warning, physical assailant using by force, and such moves may be directed persistently towards specific points. More advance thinking for this particular behavior on certain occasion confined dissimilar of race, social class, gender role, religion, sexual course, emergence behavior, body complexion, body physics, and notoriety for some particular characteristic, filiations, personal capability, size or quality . Gredler  of course, some of the symbols of bullying are manifested on the victim like melancholy, distress, somatic illness and anxiety. Stomach pains, head paining or any state of widespread public excitement and interest or alteration in bodily function that is experienced by a patient and is colligated with a specific disease, as well as physical traumas. The patient of bully is may also involved in confusion, furious, less self-esteem, and feelings of unsecured. The suffering of academic achievement has taken part with these students, as they forbidden there selves from attending school, or their mind alludes that university is not a good place for the purpose of learning. In sever example, students who bullied by others, might be devoted to suicide attacking, and might take steps toward the suicide act, if they do not treat by the supporter in the current scenario. Furthermore, we indicate that fact of existing bullied, comprehend by victims as do not take peer help and the growth of not positive beliefs pertaining others’ behaviors, social mental picture of bullying will be consistently exist in the future, probably the victim expresses his self internally weak and insecure along low self-esteem [4,10-12]. The explanation considers that signs of victimization from bullying are imposed such as, physical signs which is not explained physical injuries, not explained damage to clothing and property, the victim leaving secretly and cannot explain, somatic complaints, sleeping disorder which is resulted tiredness during class and school, no appetence, and unusually esurient someone stolen has lunch when they reach to home from school. But other side social signs take part for instance that victim is taking involvement in belligerent then they become defenseless, victims of pertinacity tantalization, during lunch and at play time adopt separation from the other boys, bystander watching two adults at the playground, very low contact out-of-schoolhours with classmates, and invited always less attention to social gatherings of peers. The role of emotion is already present in a human being that is why emotional signs are appearing on a victim of a bully. Then autonomously appear feeling of distress, nervousness, not brilliant or glaring, sad or tearful but con doesn’t express about the wrong done, changes occur in mood and behavior, explosion of choler, low self-esteem, going to school with more fright, and entreatingly verbal act of requesting to leave the school. The students are joining some special organization for achieving academic objectives such as we know. But in that time academic signs are participating in the victim of a bully. Similarly, the abrupt hesitation feel during asking question and giving answer in the class, the performance in school has been disrupted and other side concentration in the study has declined, participation in class activities has been reduced, and stated absenteeism from school . Finally, there are two types of victims. Most of victims are passive types which have characteristics of anxious, insecure and unassertive. Being bullied chances increases with such characters. The second type is known as provocative which have both characters of anxious and aggressive. They also in response of being bullied, bully others. Therefore they are both bullies and victims [1,9]. Each of the above explanations have own merits of bullying. Yet, even excessively forward that unfairness, disesteem; jeopardize egotism, the appearance of less emotional reactions have been evoked to academic study, during examination, attempting time the mind of the victim is not processed properly, the events by participating has more boredom. The proposed hypothesis is guiding the present research that bullying behavior is knowable and also leads to lack of student’s confidence level in the academic or social organization. The peer’s group role has strong reaction to the victim. That bullying is knowable and prominent common shape of the violence in the society many theories suggested from variety of perspective. The previous studies have familiar that grad six students up to ten are involved in bullying which is measured maximum, as a perpetrator, Victim, or both. Some researcher questioned that how we can observe the form of bullying. The answer was that that harassment and verbal abuse is also one form of bullying, due to this reason victim adopts social isolation and expressive of low opinion about physical appearance . According to the view of bullying and lack of confidence nexus, this phenomenon take part in middle and high school, then the effect of bullying has been appeared in the secondary level, such as social expulsion and ribbing, but may also admit physical furiousness, terror, act of stolen, racial and sexual harassment, community mortification, devastation of the property. Physical aggression is being involved more likely by the bullying at the elementary grades, but they argue that teasing is also one of the characteristic of bullying along with that feeling of being intimidated and social exclusion are observable characteristic of it . Shellard  found that the areas where less adult supervision then automatically bullying is often occurred. He specified some places where bullying is thoroughly carried out: Such as locker rooms, hallways, restrooms in the hostel, bus stop and cafeterias, while the classroom is also unsafe. One function of strong reactions may be is that, that bullying has been involved both in boy and girls. Most research discoursed that the ratio of boys is usually the both bullies and victims. However, Behavior is a central feature of our daily routine activities if the shape of behavior is not mould in proper way, then the effect will come to the social life of human beings in the society. So we deduce that from the previous research that bullying are used by boys which is more aggressively physical behave, while girls in bullying are often more elusive and also involved in teasing, social exclusion. Hoover and Oliver  showed that the girls bullies new girls and also boys involve bullying both girls and boys. In fact, behaviorist psychologists have prominent suggestion that behaviors are learnt by reinforcement negatively and positively if we will impose through positive ways then it will be more beneficial for the gainer. If negatively then it effects will be appeared on victims and victim is the small part of society which can create high level destruction in the human beings . Behaviorist theorist coincide that what we do or act this everything comes in the context of behavior. Pleasurable experiences remain optimistic re-enforcers and unpleasant experiences remain depressing re-enforcers. The lack in reinforcement could also mould behavior. In fact right path to deal psychological trouble with reference to behaviorist theoretical perspective is by shifting behavior or modification in the environment. This similar theory was also applied by Eric VanDamme in his study of identification and prevention of bullying in schools which was developed by B.F. Skinner . In many instances, bullying is the use of force the force has been used in the bullying, menace, or the act of compelling by force of authority to maltreatment, restrain, or in an aggressive manner prevail others. This behavior is most recurrent and customary. The necessity precondition is the way of conceiving something, by other or by the bully, a state of disequilibrium of social or physical strength, which differentiate bullying from squabble . Most of the researches are carried out on bullying in the west. Gredler  suggested that the prevention and intervention of bullying problems provide a way for other researcher to conduct research on this topic in late 70’s , which resulted in increase understanding regarding bullying behavior. Kim  found that most of works were done in western countries about practicing individualistic cultures regarding bullying. They conclude that there is found very little petty magnitude about the phenomenology and predictors of bullying behavior in collectivistic cultures. Similarly, Gredler  showed that when the Japan sixteen pupils committed suicide and these were recognized the victims of bullying then the intensity of issue was considered as sever social problem. According to Yoneyama and Naito  if we compare bullying with other social issues it is totally new area of research but the effect of bullying is very dangerous for the social life of human beings. When three victims were committed suicide after 1982 then it was defined as a social issue in the merit of issues. This study tested the hypothesis and appeared by the students that they understood regarding bullying behavior is increased form and also they have increase understanding of bullying results in lack of confidence of victims which leads mal adjustment of the victim in society in a manner that lack of confidence of bullying victim results in disturbance of interaction with other individuals like strong feelings of lack of support because of humiliations which he feels about himself leads to isolation from society which means social life disturbance. But in Pakistan bullying is not considered as a serious social problem there is very little awareness regarding this issue, people accepted this behavior as normal behavior. Instead of bullying chronic and life lasting effects still it is ignored and it’s less of researches done especially at Kohat University level. So it was justifiable to be studied. Thus, our interest was emerged to know the understanding of students regarding bullying and investigate relationships, and association of bullying with confidence whether according to the knowledge of bullying of the students. 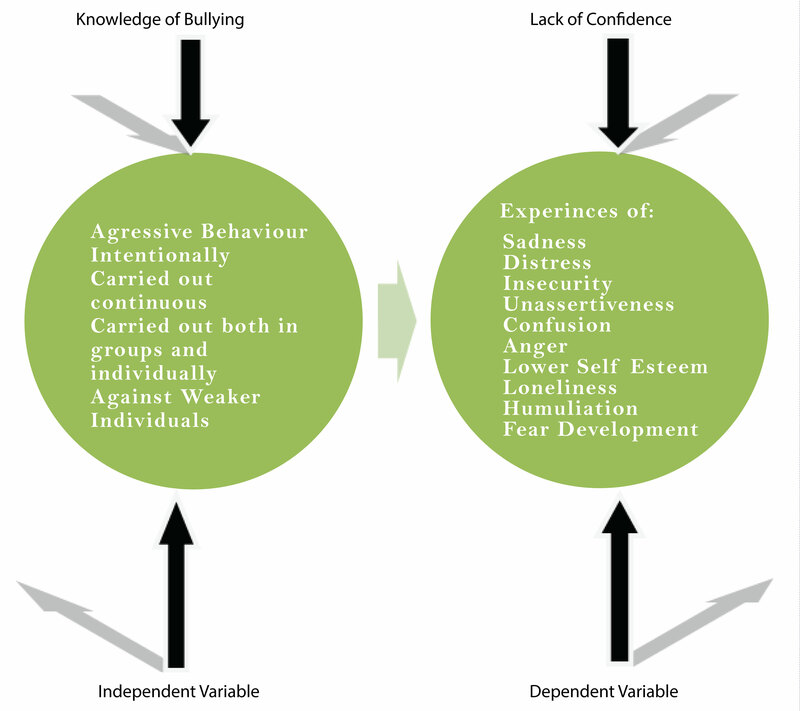 By bullying, we mean that can result in lack of confidence (Figure 1). Figure 1: Conceptual frame work. A total of 53 (35 male, 18 female, Stratified random sampling and Finite Population Correction) was recruited from the biological sciences. Of the participants, 52 (43 male, 09 female) were students from physical sciences at the university, and 45 participants (38 male, 07 female) were from the social sciences in the participant pool. The study of the universe was selected as Kohat University of Science and Technology. The total population of the university students is 3004. Biological sciences total strength was 1075. Similarly, the physical Sciences total strength was 1045. In other side social sciences total strength was 885. Stratified random sampling and FPC (Finite Population Correction) technique was used for sampling. The total population of Kohat University students was divided into three disciplines. From every discipline, 5% of total male student’s strength and as well 5% of total female students were selected as sample which is according to FPC. So the sample size was 5% of the whole population. The sample was divided into strata’s of discipline and gender. So, in the discipline and gender wise strata, there are three disciplines biological sciences, physical sciences and social sciences. Total male students of biological sciences discipline are 714 which 5% is 36 and females total 360 5% is 18. Physical science total male students are 854 of which 5% are 43 and total females 191 5% is 9. Social sciences males students’ total is 758 of which 5% are 38 and total females 127, 5% is 7. We divided our questionnaires departmental wise because our questionnaires were structured, close ended questionnaire and made it according to Likert scale method. Total 151 questionnaires were distributed among students to know the nexus between bullying and confidence. The questionnaire is the most appropriate tool for data collection in survey methods and easy for students to understand. This formula was used to determine the population size; n=Ni and N1/N, Where ni=Population of 5% total population, N1=Population size in the each strata, N=100. The SPSS (Statistical Package for Social Sciences) was used and analyzed collected data from it. Bi-variate and uni-variate analysis was done. The uni-variate analyses had expressed out for variables “Bullying” and “lack of confidence”. It composed of frequency distribution and percentage proportions of the respondents. Bi-variate analysis had been express out the study relationship between the independent and the dependent variables. This type of analysis disclosed line of the response preferring, opposing one and other feature of variables under investigation. For association between dependent and independent variable this hypotheses was developed which tells us exact relations, and other side these variable also tested by chi-square procedure . Where, the experimental frequency of cell matching to connection of “J” row & “K” feature, “r” is representing number of rows with other side “c” is representing and number of the columns. The above method absolutely target one to bring squared formulation among the frequencies for the each cell and divided by the essential frequency. Answering value has distributed as the Chi-square and relevant degrees of free will are calculated in followings . Fisher Exact Test probability= ( a+b )! ( c+d )! ( a+c )! ( b+d )! N!a!b!c!d! Similarly the total numbers of observations were denoted by “n” and a, b, c, d were analyzed in numbers of four cells in contingency tables. All data were analyzed by SPSS 20 version and including frequencies, percentage proportion, chi- square. The most ordinarily used measures to work out association for contingency tables are Lambda, Gamma, Kendall’s au-b and Pearson’s “r”. Table 1 shows data on knowledge of bullying. It is delineated from the study findings that bullying behavior involve aggression that could be Verbal, Physical or Social, can be carried out both individually and in groups. It was also found that bullying behavior is carried out repeatedly, and the victims are weak in their self defense. The findings are in line with studies of Control & Prevention,  that physical bullying in shape of punching, kicking, stolen of personal things etc. Similarly, verbal bullying is practiced like teasing, name calling, spreading wrong negative gossips, disturbing social relationships, isolation from a peer group, the felonious act of extorting money (as by threats of violence), and the feeling of being intimidated. Table 1: Knowledge of bullying. *In the above table values represent frequency when values in parenthesis stand for the percentage proportion of respondents. Table 2 shows data on the impact on confidence as a result of bullying. The findings of study suggested that the bullying results in lack of confidence. The confidence is reduced according to the response of the students, to experience of sadness, insecurity, distress by bullying victims and victims feeling unassertiveness, experiences of confusion, anger, and lowered self esteem. It’s also identified that bullying victims have sign of loneliness, suffers from humiliation and develop fear in his personality. So it’s concluded that the whole reduction in confidence caused by bullying may form lack of confidence. The findings of the studies are in matching with Olweus et al. that targets of bullying often felt interiorizing (e.g., lugubriousness, psychological suffering, and anxiety). Targets may also feeling of insecurity, anger, low self-esteem and experience of confusion. Table 3 shows data regarding the relationship between knowledge of bullying and lack of confidence. The relationship found between “bullying is aggressive behavior” and its “lack of confidence” is positive and significant. It is deduced from the findings that bullying behavior involves aggression and can greatly results in lack of confidence, according to high and clear knowledge of student’s lack of confidence. This finding is in line with Limber  study that bullying is commonly characterized as aggressive behavior, which results in lack of confidence. The delineated association between “bullying carried out individually as well as in groups” and its impacts on confidence” is highly positive and highly significant. It could be inferred from the findings that students had clear and high knowledge that bullying is carried out in either group or individually which increasingly decrease confidence of victim. Kenneth  concluded that bullying is carried out in both individually and in groups and has role in affecting confidence. Positive and non-significant association was detected between “bullying occurs repeatedly with victim” and lack of confidence of bullying victim. From the findings it is identified that students has little idea about repeatedly occurrence of bullying but they are clear about repeatedly occurrence of bullying can greatly decrease confidence, which is according to Austin and Joseph  that bullying can affect confidence creating fear, insecurity in victims personality. Association found between occurrence of “verbal form bullying” and its impacts on confidence” was significant and positive from which it can be deduced that according to clear knowledge of students verbally bullying like calling mean, hurtful words etc greatly results in lack of confidence which is in line with Association  study that bullying may take form of verbal bullying (name calling, teasing, hurtful words) which may decrease confidence by lowering self esteem, humiliation suffering. The detected association between “bullying can be done physically” and “lack of confidence” is positive and nonsignificant, which means that students observance of physical bullying is not up to the mark but there understanding is high about prevalence of bullying in physical form may also highly reduce confidence. Cohn and Canter  concluded that physical bullying in shape of kicking; punching and stolen personal belonging bad affect confidence. A non-significant and positive relationship was found between “Bullying can be done socially” and its impacts on confidence, from which it can be concluded that social form of bullying is not common among students but they clearly understand that social form of bullying can highly decrease confidence of victim. Kaufman  concluded that bullying can be done verbally in shape of teasing, name calling which results in lowering confidence by disturbing social relationships. An Inferred relationship was found between “bullying can be done only against those who are weaker to defend themselves” and lack of confidence was significant and positive, which means that students clearly know about bullying which is done only against weaker individuals which results increase amount of decrease in confidence of victim. According to the study of Nansel et al. bullying involves state of disequilibrium of power between the aggressor and the victim and as a result victim faces decrease in his confidence. Table 4 showed data regarding relationship between lack of confidence and the knowledge of bullying. A significant and positive relationship is found between bullying victim experience sadness and knowledge of bullying which means students highly understand that confidence is increasingly reduce to experiences of sadness of bullying victim. Craig  study concluded that bullying results in lack of confidence by producing experiences of sadness and anxiety in victim’s life. The relationship identified between bullying victim experience insecurity and knowledge of bullying was highly significant and positive, from which it is concluded students had high knowledge in regards to highly decrease in confidence because of bullying. This finding is in matching with the study of Olweus et al. that targets of bullying may experience insecurity which results in lack of confidence. Delineated relationship between bullying victims experience distress and knowledge of bullying was significant and positive from which it is concluded that students clearly understand bullying relation with confidence that bullying results in highly decrease in confidence. This finding is in line with O’Moore and Minton  study that bullying victim appears distressed which could lead to lack of confidence. Bullying victims experience unassertiveness and knowledge of bullying relationship was identified as significant and positive. It is deduced from the finding that bullying can highly decrease confidence by developing unassertiveness in personality. Olweus et al. concluded that bullying victims experiences distress, unassertiveness, lower self esteem with greatly reduce confidence. A significant and positive relationship was identified between bullying victim experience confusion and knowledge of bullying which means that student’s knowledge regarding bullying victim’s experience of confusion is clear that bullying results in increase reduction in confidence by developing experience of confusion. This finding is in line with study of Olweus et al. that bullying can affect confidence by producing confusion in victim’s personality. The relationship found between bullying victim experience anger and knowledge of bullying is nonsignificant but positive. It is concluded from the findings that student’s knowledge regarding bullying results in lack of confidence is high but in a sense that bullying can increase decrease in confidence by developing anger in victim’s personality. Austin and Joseph  concluded that bullying victim experience shows signs of explosive anger which is signs of lack of confidence. Bullying victim experience lower self esteem relation with knowledge of bullying was found as non-significant but positive. Relationship of “bullying victim shows a sign of loneliness” with knowledge of bullying was identified as non-significant but positive. A significant and positive relation is found between “bullying victim experience humiliation” and “knowledge of bullying”. “Bullying victims develop fear in his personal relationship” with knowledge of bullying” was found as significant and positive. No significant differences found between results of changing variables. The results showed that the strength of bullying behavior, understanding among students and its associations with the confidence of bullying victims. The associations found between variable “knowledge of bullying” and “lack of confidence” was positive and significant in shape of bullying is aggressive behavior, carried out in groups or individually, can be done verbally and can be done only against the weaker person while some of the variety of knowledge of bullying associations found with the impact on confidence were non-significant but positive which are bullying is carried out repeatedly, can be done physically and can be done socially. Sometimes such stressful situation leads to transforming victim’s behavior to violent behavior, he could adopt negative means of gaining power with the feeling of vengeance. The findings of study suggested that the bullying results in lack of confidence. The confidence is reduced according to the response of the students, to experience of sadness, insecurity, distress by bullying victims and victims feeling unassertiveness, experiences of confusion, anger, and lowered self esteem. It’s also identified that bullying victims have sign of loneliness, suffers from humiliation and develop a fear in his personality. So it’s concluded that the whole reduction in confidence caused by bullying may form lack of confidence. These things can put the nation’s future at stake. So, serious policy and interventions should be made to control the curse of bullying. The study was limited in several ways: First, the study use convenience sample that could save our time and resources. Secondly caution must be applied study findings can’t be applied to the whole society, thirdly study was not designed to investigate factors responsible which could lead to bullying behavior, and Fourth limitation was the study only investigated impacts on victims nor actor of bullying and last limitation was that only understanding of students regarding bullying behavior is studied nor their own practical experiences. Further work needs to be established on degree of bullying other then education institutions, impacts of bullying on bullies, causes of bullying. A reasonable approach to tackle this issue is to make this behavior fully unacceptable. A significant of (p<0.5) and of positive (γ=.307) relationship had found between bullying is aggressive behavior and lack of confidence. On the other hand highly significant (p<0.5) and positive (γ=.786) relationship was found between bullying is carried out individually as well as in groups and lack of confidence. The relationship of bullying is carried out repeatedly with lack of confidence was non-significant (p>0.5) but positive (γ=.396). Relation found significant (p<0.5) and positive (γ=.673) between bullying can be done verbally and lack of confidence. A nonsignificant (p>0.5) but positive (γ=.156) relationship was found between bullying can be done physically and lack of confidence. Relationship identified between bullying can be done socially and lack of confidence was non-significant (p>0.5) but positive (γ=.408). A significant of (p<0.5) and of positive (γ=.248) relationship had found between bullying is carried out only against weaker and lack of confidence. A significant (p<0.5) and positive (γ=.508) relationship was found between bullying victim experience sadness and knowledge of bullying while the relationship of bullying victim experience insecurity with knowledge of bullying was found as highly significant (p<0.5) and positive (γ=.541). Bullying victim experience distress relation with knowledge of bullying was identified as significant (p<0.5) and positive (γ=.512). A significant (p<0.5) and positive (γ=.413) relationship was found between bullying victim experience unassertiveness and knowledge of bullying. The identified relationship of bullying victim experience confusion with knowledge of bullying was significant (p<0.5) and positive (γ=.419). Non-significant (p>0.5) but positive (γ=.375) relationship of bullying victim experience anger with knowledge of bullying was found, however relationship of “bullying victim experience low self esteem” with “knowledge of bullying” was non-significant (p>0.5) but positive (γ=.0.77). A non-significant (p>0.5) but positive (γ=.316) relationship was found between “bullying victim shows sign of loneliness and “knowledge of bullying”. The relationship between “bullying victim suffers humiliation” and “knowledge of bullying” was found as significant (p<0.5) and positive (γ=.502). A significant (p<0.5) and positive (γ=.472) relationship was found between “bullying victim develop fear in his personality” and “knowledge of bullying”. These findings suggest several courses of actions for the prevention of bullying in light of Olweus bullying program  as follows: The primarily responsibility is placed upon individuals who are involved in running of the institutions whether institutions are of schools, universities or else they need to design remedial strategies on permanent basis. This could be only in case when bullying is considered as ill and fully unacceptable. Therefore First need is of serious attention to this issue. The faculty of institutions should survey anonymously students in order to analyze the prevalence and nature of bullying. Conduct discussions, conferences regarding the bullying issue and educate parents, teachers, administrators and community members through them. According to responses strategies can be designed. Teachers at classroom level forum rules against bullying and make strategies of discussion corner with students to discuss this issue. In bullying prevention remedial strategies not only victim, but also bullies (who bully others) must be taken into account in a sense to make them contribute. The main objective of the study was to investigate and determine the effects of bullying on the confidence of students. Chi square and Gamma statistics were used to investigate associations and direction of the relationship between independent and dependent variables. Data was collected through questionnaires. Cronbach’s Alpha was applied in computing the internal consistency of the variable which came to be 0.7. It was statistically proved that bullying affects the confidence of the students. As a positive and significant relationship was detected between bullying and lack of confidence. It was found that bullying is aggressive behavior, which is carried out individually and in groups. It is done verbally and mostly against those who are unable to defend themselves. Bullying victim’s experience sadness, insecurity, distress, unassertiveness, confusion, anger, lower self-esteem. They show signs of loneliness, suffer humiliation and develop a fear in their personalities.